These are the current and upcoming declared dividend pay dates and amount(s) expected from each stock (usually projected on the ex-dividend date, or after market close the prior trading day). These amounts are a compilation from all of our accounts, so some is taxable, some is tax-deferred, but most is tax-free. 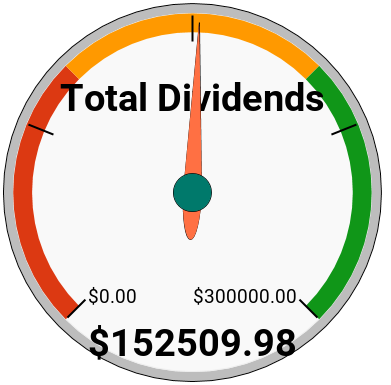 If you check out my Expected dividend spreadsheets you can see how it all breaks down, or you could just read my posts and look at the screenshots (ooooh, pretty pictures!). The above amounts are subject to change due to sales/acquisitions of shares during the month and new dividend declarations/increases/reductions, etc. I ended 2018 with $20,366.61 for the year, which is higher than the 2017 total of $14,428.58 by $5,938.03. I ended 2017 with $14,428.58 for the year, which is lower than the 2016 total of $21,007.34 by $6,578.76. I ended 2016 with $21,007.34 for the year, which is lower than the 2015 total of $29,054.25 by $8,046.91. Most of this dividend income is now untaxed, though. The 2015 total of $29,054.25 is higher than the 2014 total of $26,936.57 by $2,117.68, which is higher than the 2013 total of $25,265.03 by $1,671.54, and is almost double my first year total of $14,331.13 for 2012, which is when I first transitioned to dividend investing for income. Dividend paying issues that I hold mostly pay monthly dividends.